Comfort and Purity: The Quilted Organic Cotton Deluxe is a luxurious non-waterproof organic baby crib and toddler mattress. It will provide your child with a more natural, healthy and comfortable sleep environment. Naturepedic follows the precautionary principle and eliminates questionable chemicals in the first place. Naturepedic also avoids the use of certain conventional mattress materials such as vinyl/PVC and polyurethane foam in favor of materials such as organic cotton, organic latex rubber and organic wool. In addition, Naturepedic eliminates perfluorinated chemicals (PFCs), questionable fire retardant chemicals, and antibacterial biocides. Luxuriously Quilted Organic Cotton Fabric: Features a luxuriously quilted organic cotton fabric for a more mature mattress feel. Perfect for older children and daybeds. Please note that this mattress is not waterproof and would require a Waterproof Organic Protector Pad for full waterproof and dust-mite protection. Organic Cotton Filling: Organic cotton is the purest form of cotton and a healthier alternative to synthetic fabrics and foams. Naturepedic uses only U.S. grown and certified organic cotton as filling for its mattresses and buys directly from USDA certified sources. This increases purity, organic reliability and support for U.S. farmers. Fire Protection Done Right: Due to our innovative natural design and intelligent mattress construction, Naturepedic passes all Federal and State flammability standards without the use of any fire retardant chemicals or FR barriers. This is achieved through superior product design, the use of more natural materials (i.e. organic cotton fabric, organic cotton fiber and pla fiber) and the elimination of polyurethane foam. Organic & Greenguard Select Certified: Not only are our individual materials certified, but the finished mattress is certified as well. This ensures that all components meet a healthy non-toxic standard. Certified by OTCO to the Global Organic Textile Standard (GOTS). All Naturepedic products are also tested for chemical emissions and certified according to the most stringent GREENGUARD® "select" certification standards. Quality Workmanship: Naturepedic is a family owned business located in Chagrin Falls, Ohio. Our workers are skilled Amish craftsmen that take pride in their work, paying special attention to every detail to ensure long lasting durability. We are proud to offer the very best organic mattresses available anywhere. Lifetime Limited Warranty: We are so confident in our products that we are happy to stand behind them with a lifetime limited warranty. We are quite proud of our extremely low warranty claim rates but are here if you need us. Rest easy knowing you are in good hands. *Shipping: Usually ships in 1-2 weeks. $90 curbside delivery anywhere in Canada. This item ships directly from the manufacturer. Because of this, orders to Alaska and Hawaii may incur additional shipping charges at the time of shipment. In such cases, the customer will be contacted for approval prior to incurring additional charges. This product cannot be gift wrapped. Naturepedic was founded by Barry A Cik, a quarter century veteran in the field of environmental engineering. In anticipation of his first grandchild, Barry went searching for a suitable baby crib mattress. Sadly, he found all of the crib mattress offerings completely unacceptable and was in shock at the state of the industry. "I knew all about vinyl/PVC, polyurethane foam, and the various chemicals contained in them and there was no way I was going to put my grandchild to sleep within a few inches of these chemicals." Barry then set out to find a suitable organic baby crib mattress. 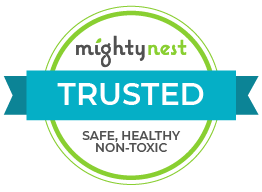 "All of the organic baby crib mattresses on the market contained either latex, wool, or both, and were not waterproof... if the mattress were to get wet, it would grow mold and fungus without any effective way to clean it. The wool/latex issue left a lot to be desired considering their known allergenic properties." According to Barry, "the organic baby mattresses were nothing more than miniaturized adult mattresses, which made little sense for babies." Barry, together with his two sons, set out to found Naturepedic, an organic and non-toxic baby crib mattress company dedicated to providing parents with a better alternative - the first and only waterproof organic baby crib mattress designed with a safe food grade polyethylene cover, and which eliminates the potentially harmful chemicals with which Barry was so familiar. Due to the success of the No-Compromise Organic Baby Crib Mattress, Naturepedic has launched many new models to meet the growing demand for high quality non-toxic baby and children's mattresses and bedding.